Explore Direfrost Keep and return Undaunted. 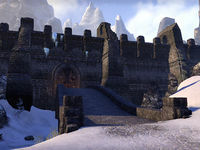 Maj al-Ragath of the Undaunted has challenged me to explore the frosty ruin of Direfrost Keep, which lies flush against the mountains of Eastmarch. Kill the Guardian of the Flame. Kill Iceheart, the Empowered Frost Atronach. This page was last modified on 14 August 2017, at 23:09.